Merry Christmas Sweetie.. I hope you and your family enjoy your holidays. May the new year bring you great things. happy x-mass hun for you and your familly,all the best! i wish you you a Merry Xmas and happy new year.. Kiss and hug to all your! Love ya to girly, I look forward to whipping ur buttocks again rofl. 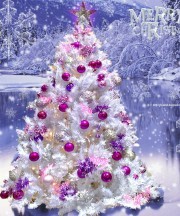 I wish you and your family a Merry Chirstmas,Happy New Year.I hope you have a good xmas sissy. Hey dolph hun!! Just wanted 2 say hello and love the pics nice. Loves ya hun!!!! Hiya hun, Just wanted to stop by and say hey, I am glad we are good friends, I am glad I meet you on here, I hope you have a happy new year!!!!!!!!! hug and kiss from chile , for you and your family.. Thanks for all the tourneys you host, your such a beautiful person inside and out. Thanks for being my friend. Love your profile, its cute. aww hun...u are an inspiration to me....my son was born deaf...but it was rectified by surgery.....and all 'those' feelings i had at the time make me realise when i meet someone like you that it wouldve made no difference to how much i loved him or how much he could still achieve. you and skull are amazing ppl and i luv u to death bcos u have strength i could only hope to have.